The Klir Drop In Automatic Fleece Filter fits directly into most 4" filter sock chambers. It automatically unrolls new material as it gets clogged, removing suspended particles from your aquarium and producing crystal clear water. Enjoy maintenance-free aquarium filtration for months at a time. The Klir filter is a direct replacement for filter socks on sumps with sock trays. Simply remove your sock and insert the Klir. As water passes through the Klir filter and the filtering material becomes saturated with waste, the water level will begin to rise. When the water makes contact with the optical sensor, a motor is activated to advance clean filtering material. As clean material is exposed, water is now able to flow freely, lowering the water level in the sock tray and deactivating the motor. If you do not have a sock tray in your sump you can use the Klir Drop In Automatic Fleece Filter 4" Filter Bracket. 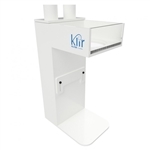 If you want to use the Klir Drop In Automatic Fleece Filter, but your sump does not have a sock tray, then you can use this Klir Drop In Automatic Fleece Filter 4" Filter Bracket. Dimensions: 7.4" x 5.25" x 12.625"
Replace Fleece for the Klir Drop In Automatic Fleece Filter. 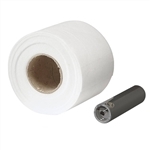 25 yards of 50-micron Fleece with disposable collection spindle. 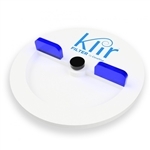 For use with the Klir Drop In Automatic Fleece Filter. 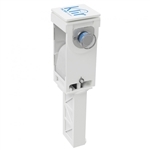 The Klir Filter 4" Flow-Diverting Cap will cap any unused sock filter holes. Or, you can partially open it to reduce flow to a particular sock tray.